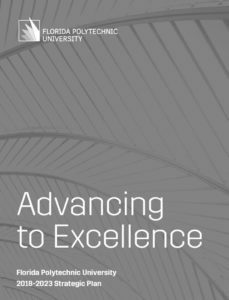 Titled Advancing to Excellence, the Florida Poly 2018-2023 strategic plan outlines the academic and economic goals the University will work to attain by the year 2023. One of those goals is to influence the economic development of the 4,000 acres that surround Florida Poly, to create a research park that would bring together industry, academia, and government. The strategic plan was approved by the Board of Trustees in September 2018. Read the Florida Poly news story. 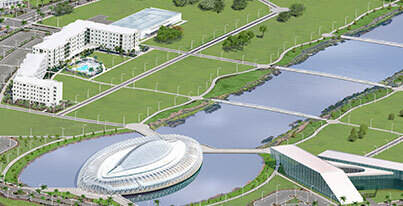 Florida Poly’s vision includes the development of a robust research park adjacent to the campus that will drive economic growth in Florida. The goal is to develop a space where private companies and academic researchers come together to commercialize innovation and where an entire community of people, who are not even here yet, come together to live, work, and play. By building prominent programs in high-paying industries, our students will have meaningful careers in exciting industries and our state will have a workforce that helps attract important industries that drive economic growth. The University has made significant progress these first five years by creating a project-based curriculum and attracting high-quality students through generous scholarships. We have grown our facilities and built a productive faculty and staff that are excited about building a new university. With national student success rates in engineering being low, and the lack of “retreat” majors at Florida Poly, this priority is critical to our long-term success. Early work at the University centered on building academic success services that included a digital library, mental health counseling, and advising and tutoring for our academically challenging classes. Later, career counseling and connections to internships became important as our students transitioned into their majors. Student development advised our Student Government Association as they represented the interests and concerns of the student body and supported clubs and organizations that built academic and social programs. Student development also established intramural athletics, wellness programs, self-development and preventative programming that helped create a responsible and growing student life on campus. Attracting and building a high-technology ecosystem around Florida Poly is imperative to its future growth and success. Building partnerships with industry to help them solve their problems and providing talented graduates that enable growth are two important elements that underlie that ecosystem. In our first five years, we built over 200 industry partnerships and have grown many of these to include multiple levels of interaction. External research grant proposals have grown each year as we hire more faculty and make important investments in research infrastructure. In 2018 we will break ground on our state-of-the-art Applied Research Center, and that will also become an important element in attracting a high-technology economy around the University. A STEM degree offers our students opportunity and mobility while contributing to the growth of our economy. These degrees demand expensive resources at the same time more and more pressure is being placed on the University’s operating budget. Additionally, students and parents expect a learning experience filled with academic quality, innovative safety measures and an overall enriching student life, but do not want to incur the debt typically associated with university degrees. Affordability and efficiency are thus essential components in our efforts to maximize value for the student. We are grateful beyond words for the leadership, insights, understanding and hard work of people from every facet of the Florida Poly family in developing this plan. Without them, this would not be possible. Now, we look forward to implementing this plan and preparing for a future of excellence.